Is the developmental role of p53 associated with the tumor suppressive function of p53? The viability and subtle developmental defects of p53 knockout mice suggest that p53 does not play major role in development. However, contradictory evidence also exists. This discrepancy mainly results from the lack of molecular and cellular mechanisms and the general fact that p53 activation requires stresses. Recent studies of p53 in mouse and human ES cells and induced pluripotent stem (iPS) cells shed new light on the mechanisms of the developmental roles of p53. This review summarizes these new studies that support the developmental roles of p53, highlights the possible underlying molecular mechanisms, and discusses the potential relationship between the developmental roles and the tumor suppressive function of p53. In summary, the molecular mechanisms underlying the developmental roles of p53 are emerging, and the developmental roles and tumor suppressive function of p53 may be closely related. The history of the p53 field has made several turns. When it was first discovered as a SV40 binding protein, it was believed to be an oncoprotein because it is highly expressed in many types of tumors and the p53 cDNA from these tumors can transform normal cells together with H-Ras [1–6]. Later on, studies by several laboratories convincingly showed that wild type p53 is a tumor suppressor [7–9]. Because the mutation of the p53 gene occurs in more than half of human tumors, all of the earlier cloned p53 cDNAs from these tumor cells had mutations that either disrupted the activity of p53 or made p53 oncogenic. Soon afterwards, p53 mutants were found to have gain-of-functions, which explain some oncogenic phenotypes of mutated p53 cDNAs . Therefore, a single amino acid change of p53 could switch it from a tumor suppressor to an oncogene. Similar to these studies in tumor cells, the studies of the developmental roles of p53 have also generated puzzling, sometimes contradictory, data. The absence of obvious developmental defects in p53 knockout mice strongly suggests that p53 is not required for development . Other studies, however, suggest that p53, under certain conditions, is involved in the development of mice [12, 13]. In Xenopus, p53 loss causes developmental defects by interacting with TGF beta signaling [14–16]. Recent studies using embryonic stem cells as a model system to study the function of p53 provided interesting insights into the developmental roles of p53. This review will highlight these new studies and re-visit the possible models of p53 in development. Given that p53 is important and highly expressed during development, it was surprising to observe that p53 knockout mice developed normally, while the adult mice quickly developed tumors . Since then, it had been believed that p53 does not play a role during development. Subsequent studies by two independent groups revealed that p53 null mice are subject to subtle developmental defects with exencephaly being one of the major developmental defects and, to a lesser degree, craniofacial malformations [12, 13]. These developmental defects are dependent on the genetic background and gender. Mice with 129/Sv background and females are more affected by p53 loss than C57BL/B6 and male mice. The exencephaly penetrance is about 23% in the females of 129/Sv strain. These results suggest a subtle role of p53 in neural development. It is unclear why p53 loss affects females more than males and why the penetrance of developmental defects is low. The possible roles of p53 in neuronal development have been thoroughly discussed in another review article . Another organ that has obvious defects in p53 knockout mice is the testis . The testes from p53 knockout mice contain multinucleated cells resulting from primary spermatocytes that fail to undergo meiosis . However, this spermatogenesis defect is observed in adult mice, and it is unknown whether the abnormality initiates from the embryonic stage. Mice with a 129 genetic background are more susceptible to spermatogenesis defects. This observation is coincident with the fact that 129 mice with p53 knockout develop teratomas at a high frequency and are sterile. But more studies are needed to establish a firm connection between the roles of p53 in spermatogenesis and teratoma suppression. Recently, p53 has been shown to play a role in kidney development through activating the expression of Pax2, a critical transcription factor for kidney development  (Table 1). Intriguingly, Pax2 inhibits the activity of p53. Therefore, this mutual regulation forms a negative feedback loop during nephrogenesis . Through genome-wide analysis, the kidney developmental pathways have been linked to clear cell renal cell carcinoma (ccRCC) . Therefore, future studies need to address whether the p53/Pax2 axis is involved in the initiation or progression of ccRCC. The most direct evidence showing that p53 is able to affect development is from the study of mdm2 knockout mice. Mdm2 knockout mice die between implantation and E5.5, around the stage of blastocysts from which embryonic stem cells are derived [21, 22]. In addition, crossing Mdm2 knockout mice with p53 knockout mice completely rescued the lethal phenotype. Because ES cells are derived from blastocysts, these results provide strong biological evidence that p53 can be activated at the ES cell stage. During normal development, its activity is kept in check by Mdm2 and its homologue Mdm4 (also called MdmX). Interestingly, Mdm4 null mice die around 7.5-8.5 d.p.c. (days post coitum), suggesting that Mdm4 and Mdm2 play non-redundant roles during early development. The lethal phenotypes of both Mdm2 and Mdm4 knockout mice can be completely rescued by p53 null mice, demonstrating that p53 is involved in the developmental lethality of Mdm2 and Mdm4 knockout mice. Similar rescue and partial rescue phenotypes were observed in mES cells, blastocysts, or mice with knockouts of other genes, such as Brca1 [23–25], Brca2 , Rad51 , Cdc7 , Pict1 , L11 , Aurora kinase A , or Tsg101 . Most of these genes are involved in DNA repair, cell cycle regulation, and nucleolar stress. These studies demonstrate that p53 can have developmental roles when the dysregulation of certain genes causes DNA damage, ribosomal stress, or other un-identified stresses. p53 also can influence mouse embryo implantation by regulating the maternal Lif levels  (Table 1). Lif is an important maternal factor that facilitates embryo implantation. Loss of p53 in female mice greatly decreases the number of implanted embryos. This may represent one of the ways to decrease the reproductive ability of females with p53 defects. As mentioned above, p53 defects also cause abnormal spermatogenesis in mice . Therefore, it is reasonable to speculate that loss of p53 and other p53 family members, p63 and p73, will eventually lead to reproductive disadvantage . Indeed, the roles of p63 and p73 in reproduction have been reported [35, 36]. Interestingly, the effect of p53 loss on embryo implantation is more severe in C57BL/6 J background, while the effect on spermatogenesis is more obvious in 129Sv background, suggesting that the genetic background of the host can influence the effect of p53 loss on implantation . An interesting study showed that p53 dependent apoptosis may be involved in X irradiation-induced teratogenesis . In this study, X irradiation was used to treat implanted embryos at day 3.5 of gestation. 73% of p53+/+ embryos had early death, while 27% survived and displayed normal development. In contrast, only 44% of p53-/- embryos died early, 30% died late, 22% had developmental anomalies, and only 4% developed normally. These results indicate that p53-dependent apoptosis antagonizes teratogenesis by inducing embryonic death and involving an un-characterized “repairing” mechanism. The potential developmental roles of p53 have been extensively covered in another review article [38, 39]. However, the molecular and cellular mechanisms of are not well characterized. Due to the introduction of novel technologies, such as genome-wide approaches, recent studies of p53 in ES cells shed some new light on this old topic [40, 41]. In addition to its role in ES cells, p53 also has functions in other adult stem cells, such as muscle cell progenitors and osteoprogenitors [42, 43]. The activity and levels of p53 in early embryos are higher than those in late embryos [44–46]. In vitro, the levels of p53 in ES cells decreases as ES cells differentiate . Because ES cells are derived from blastocysts, they represent an excellent model system to study the early developmental role of p53 . Without stresses, the high levels of p53 do not lead to the apoptosis or differentiation of ES cells because its activity is inhibited by Mdm2 and Mdm4 . Removal of Mdm2 causes cell death at the blastocyst stage, indicating that p53 is poised for activation at the ES cell stage. Interestingly, deletion of Mdm4 leads to embryonic death at a later developmental stage. But it is possible that Mdm4 plays a cooperative role with Mdm2. A recent study suggests that Mdm4 has a function in ES cells . Delta40-p53 is a naturally occurring splicing variant of p53, with an amino terminal deletion of 40 amino acids . Delta40-p53 is highly expressed in ES cells and inhibits p53-dependent transcriptional activity. In addition, delta40-p53 appears to affect the Insulin Growth factor 1 receptor (IGF-1R) signaling, which has been shown to participate in the differentiation program of ES cells. It is currently unknown whether Delta40-p53 cooperates with Mdm2 and/or Mdm4 to suppress the activity of p53. It is likely that multiple distinct mechanisms exist in ES cells and embryos to maintain low activity of p53. p53 can be activated in ES cell stage under certain conditions, such as Brca1 deletion. Brca1 is a protein that is involved in repairing DNA double strand breaks through homologous recombination. Its deletion in ES cells activates p53, causing the differentiation and/or apoptosis of ES cells. Therefore, ES cells containing Brca1 deletion are not viable [23, 51] (Figure 1). The reduction of p53 levels in ES cells by short hairpin RNA (shRNA) can rescue the lethality caused by Brca1 loss, demonstrating that p53 activation is downstream of Brca1 loss. Similar results were observed in the Aurora kinase-p53 axis in mES cells . The roles of p53 in ES cells and blastocysts. A, Mouse ES cells (in vitro) are derived from blastocysts (in vivo) at embryonic day 3.5. B, In the absence of stress, p53 is inactive in ES cells. But it can be activated by exogenous or endogenous stresses, such as DNA damage, in mES cells. For example, the loss of Brca1 causes endogenous DNA damage stress, which in turn activates p53 to elicit differentiation and apoptosis of mES cells. C, A hypomorphic Brca1 mutant causes DNA damage in blastocysts. When p53 is intact, the DNA damage signal will activate p53 and cause the death of the blastocyst. Therefore, the developmental process is canceled. When the p53 surveillance system fails, the developmental process goes on, while the female mice develop mammary gland tumors in adulthood. Although it is clear that p53 induces apoptosis in human embryonic stem cells (hESCs) in response to DNA damage [52, 53], it is controversial whether p53 can induce apoptosis in mES cells. Some studies showed that p53 is sequestered in the cytoplasm of mES cells, and that mES cells undergo p53-independent apoptosis in response to DNA damage . Others have found that mES cells undergo p53-dependent apoptosis . Different batches of sera, media, and the heterogeneity of ES cell culture could potentially explain this discrepancy. Despite the controversy of the apoptotic function of p53, the differentiation regulation is a well-established function of p53 in mES cells. Upon DNA damage, p53 induces the differentiation of mES cells by repressing the transcription of Nanog (Figure 2A) . Apart from its pro-differentiation activity, p53 also induces the transcription of many Wnt ligand genes upon DNA damage to delay the differentiation of neighboring cells (Figure 2A) . However, in differentiated cells (e.g. mouse embryonic fibroblasts) and neural progenitor cells, the induction of Wnt ligands by p53 is greatly attenuated, suggesting that the p53/Wnt axis may play a unique role in ES cells. It is possible that the p53/Wnt axis acts as a compensatory or “repairing” mechanism to restore the ES cell population . Molecular mechanisms underlying the roles of p53 in ES cells and iPS cells. A, In response to DNA damage, p53 can directly repress the transcription of several master regulators of mES cells. p53 also induces the transcription of several Wnt ligand genes, whose protein products are secreted from the stressed mES cells to act on neighboring cells in a paracrine manner. 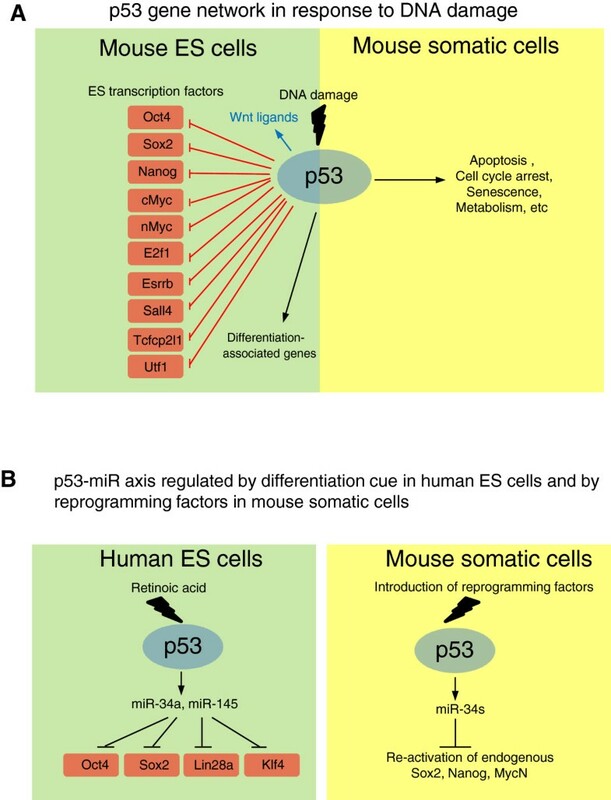 Interestingly, p53 up-regulates differentiation-associated genes in ES cells, suggesting that p53 signaling connects to the developmental circuitry in ES cells upon DNA damage. The cellular outcomes of p53 signaling in somatic cells are shown as a comparison. The p53-dependent cell cycle arrest and senescence are absent or have not been reported in mES cells. B, In human ES cells, p53-miR axis is induced by a differentiation signal, retinoic acid (RA). p53 activates miR-34a and miR-145, which in turn repress Oct4, Sox2, Lin28a, and Klf4. p53 also induces the expression of miR-34a, b, and c in mouse somatic cells upon the introduction of reprogramming factors. These miRs repress Sox2, Nanog, and nMyc, the reprogramming factors. It is emerging that p53 is fully functional in mES cells in response to DNA damage stress. In mES cells, p53 seems to play an important function by regulating the development-associated genes because these genes are more enriched in p53-regulated genes than apoptosis- and cell cycle-associated genes [31, 40]. This observation probably represents the fact that ES cells are derived from an early developmental stage. As a well characterized cellular state, ES cells serve as a good model system for studying the early developmental events of p53 signaling. It is noteworthy that the roles of p53 in development could go beyond those discovered in ES cells, and the different epigenetic parameters at different developmental stages could affect the p53 signaling as well. Technical advances of isolating pure populations from early embryos will enable the analysis of p53 activity at different lineages in the future. One of the surprising findings about the molecular mechanisms of p53 during development is that the p53 stress signaling and the developmental signaling merge at their downstream gene level . Upon DNA damage, p53, like the differentiation cues during development, activates differentiation-associated genes while repressing self-renewal genes in ES cells . Interestingly, in mES cells p53 is able to regulate gene transcription through binding to the enhancers far from the gene body . This opens up a new avenue to study the transcriptional regulation, particularly repression, by p53. In mES cells, in response to DNA damage, p53 represses the transcription of many master regulators . Surprisingly, p53 does not bind to the promoter of these master regulators. Instead, p53 binds to the distal regions to interfere with the enhancer activity. It is worth noting that the interference of enhancer is only one of the mechanisms underlying the p53-mediated repression. p53 uses many different ways to repress gene transcription in different cell types, although most of these mechanisms involve the promoter binding of p53 [60–63]. In human cells, p53 has also been shown to bind to the enhancers of development- and environment-associated genes . However, it is unknown whether the binding of p53 to the enhancers in these human cells influences the transcription. The precise mechanism of how p53 interferes with the enhancer activity is unclear. A recent study indicates that p53 activates enhancer RNAs (eRNAs) to up-regulate transcription . Therefore, it is reasonable to speculate that p53 could interfere with the expression of eRNA to repress transcription. Because enhancers normally drive the cell type-specific gene transcription, it is possible that p53 may repress the transcription of cell type specific genes . In summary, p53 is connected to the developmental gene network and is able to regulate the network during developmental stresses, suggesting that p53 may act as a surveillance system to ensure normal development. In human ES (hES) cells, p53 plays important roles in regulating their differentiation and apoptosis (Figure 2B) [53, 67]. p53 can elicit cell cycle arrest in hES cells but not in mES cells [54, 59, 68, 69]. The difference may result from the fact that hES cells are developmentally similar to mouse epiblast cells (around 5.5 day of the embryo) and mES cells are from 3.5-d blastocysts [70, 71]. p53 promotes spontaneous apoptosis and differentiation of hES cells . Upon retinoic acid (RA)-induced differentiation, p53 is activated and post-translationally modified . The activated p53 then induces the transcription of miR-34a and miR-145, which can target the master regulators of ES cells, such as Oct4, Sox2, Klf4, and Lin28a . A similar mode of action of p53 is also observed in the reprogramming of mouse MEF cells into induced pluripotency stem (iPS) cells (Figure 2B) . There is no doubt that p53-miR plays an important role in repressing the master regulators of ES cells. Notably, the repression of the master regulators by the p53-miR axis occurs 24 hours after the RA treatment, suggesting that it is a slower process than p53-mediated interference of the enhancer activity in response to DNA damage, which occurs within 8 hours . Therefore, p53 may employ multiple mechanisms to ensure the complete silencing of these master regulators. Another possibility is that 53 may behave differently in human and mouse ES cells since these two cell types represent two distinct developmental stages [70, 71]. Future studies need to address the relative contribution of and relationship between the p53-miR axis and interference of enhancer activity in p53-mediated repression. The tumor suppressor p53 elicits many cellular functions after various stresses, such as DNA damage, hypoxia, virus infection, and unfolded protein shock. However, the connection between the cellular function and the tumor suppressive function is still unclear despite more than 30 years of study. Cell cycle arrest (reversible), senescence (irreversible cell cycle arrest), and apoptosis all have been shown to participate in tumorigenesis, suggesting that they may contribute to the tumor suppressive function of p53 . Cdkn1a (also called p21 or Waf1), one of the downstream targets of p53, regulates cell cycle arrest and senescence . Bbc3 (also called Puma) is required for p53-dependent apoptosis . However, both Cdkn1a and Bbc3 are dispensable for the tumor suppressive function of p53, and they are not frequently mutated in human cancers, suggesting that other un-identified mechanisms are also involved [74–76]. One of the possibilities is that all the p53-mediated cellular functions are playing redundant roles during tumor suppression. The disruption of each of these cellular functions individually does not phenocopy the loss of p53 . Another possibility is that we have not found the right p53 downstream targets that mediate the tumor suppressive function of p53. For example, an elegant study using a mouse model harboring a transcription-dead p53 mutant, p53 (25,26,53,54), showed that the transcriptional activity of p53 is absolutely required for its tumor suppressive function . Interestingly, another p53 mutant, p53(25,26), cannot induce genes involved in acute DNA damage response while still maintaining the tumor suppressive function. These results show that the acute DNA damage associated genes cannot explain the tumor suppressive function of p53. Another possibility is that other under-appreciated functions, such as the metabolic or developmental role, of p53 are related to the tumor suppression by p53 . The metabolic function of p53 has attracted much attention recently because even a p53 mutant that is defective in cell cycle arrest, apoptosis, and senescence still has tumor suppressive function [77, 78]. Notably, this same p53 “super” mutant still maintains its function in regulating the metabolic pathway, suggesting that the metabolic pathway might be one of the underlying pathways responsible for the tumor suppressive function of p53. Thus far, the developmental role of p53 has not been formally linked to its tumor suppressive function. Development, by classical definition, is the time between zygote and birth, while most cancers, except for certain pediatric cancers, originate from somatic tissues. But the signaling pathways utilized by development, such as the Wnt, Notch, and TGF beta signaling, could be re-wired into a cancer program. Future efforts should be put into the investigation of the normal developmental roles of p53 and compare them to those in cancer cells. Systematic analyses show that p53-regulated genes in ES cells are playing a role in breast cancer and prostate cancer, suggesting that the role of p53 in ES cells may shed light on its tumor suppressive function [79, 80]. One typical example demonstrating the relationship between the developmental role and tumor suppressive function of p53 is the functional interaction between Brca1 and p53 (Figure 1C). In development, a hypomorphic Brca1 mutant (Brca1Δ11/Δ11) is not compatible with life. Crossing Brca1Δ11/Δ11 mice with p53 heterozygous or null mice completely rescue the embryonic lethality of Brca1Δ11/Δ11 (Figure 1C) . However, most p53+/-;Brca1Δ11/Δ11 female mice develop mammary tumors in their adulthood (within 6-12 months). This example shows that the failure of p53 signaling during development could also lead to tumorigenesis in the adulthood. 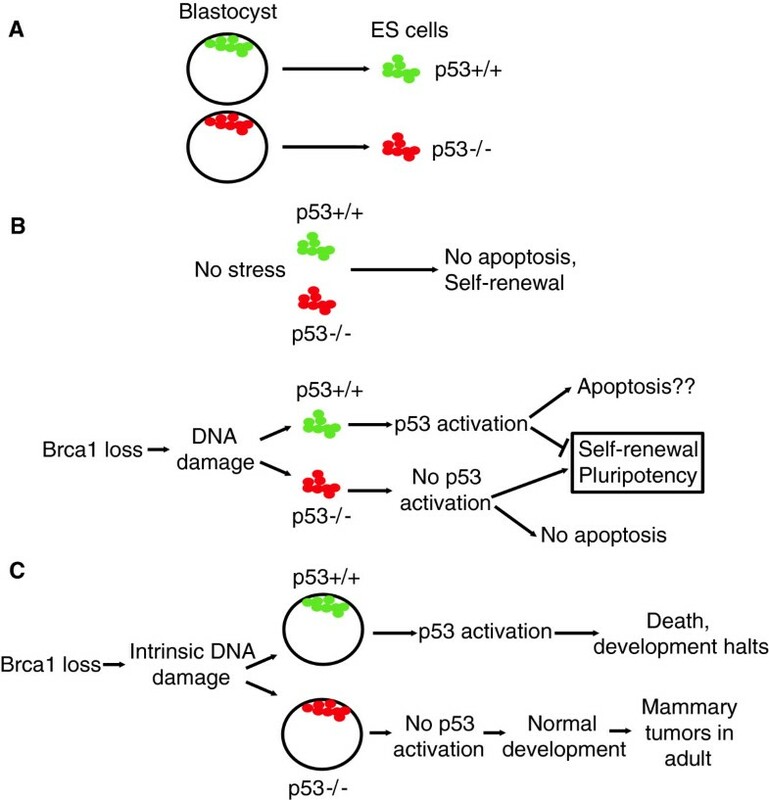 As described above, p53 loss partially rescued the dys-regulation of other genes, such as Brca2 and Rad51, suggesting that the complete loss of these genes also activates p53-independent pathways to cause embryonic lethality. Further studies are required to determine whether the same scenario exists for other genes or in human development. There are at least two non-exclusive models for p53 in development (Figure 3). The first model, named the “constitutive” model, states that p53 has a constitutive or active role in regulating the developmentally essential genes (Figure 3A). Other functionally redundant players, e.g. p63 and p73, could partially compensate for the loss of p53. Therefore, the loss of p53 only causes a low penetrance of developmental defects, such as rare exencephaly. This “constitutive” model is relatively straightforward and separates the function of p53 in acute stress response from its developmental roles. This model is also supported by studies in Xenopus, in which the loss of p53 completely blocks the development [14–16]. However, it cannot explain why the complete loss of p53 also only results in low penetrance of developmental defects. 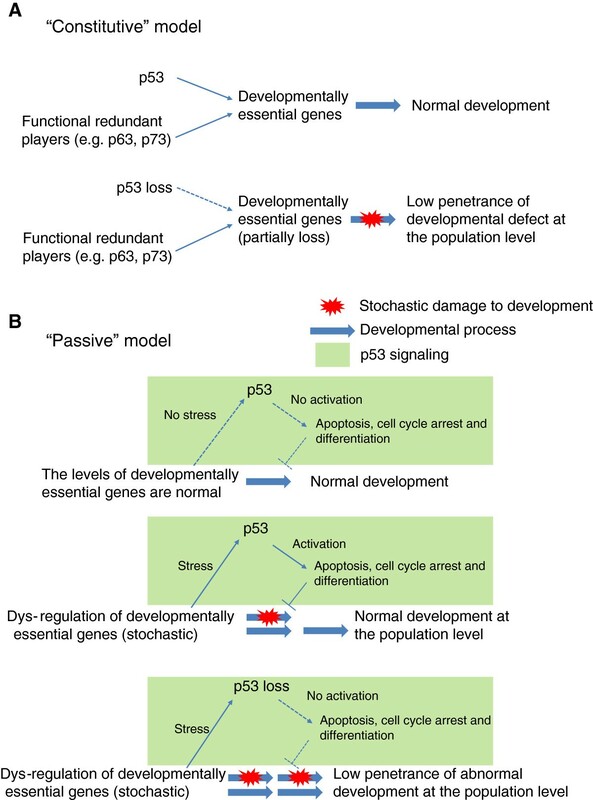 The second model, called the “passive” model, combines the stress responsive function of p53 with its developmental roles (Figure 3B). In this “passive” model, p53-mediated stress responsive signaling will be activated only if the developmental process is dys-regulated. Normally, the dys-regulation of developmentally essential genes happens stochastically in embryos. It is this stochastic feature of developmental dys-regulation that causes the incomplete penetrance of developmental defects in p53 knockout mice. Although p53 activation could be detrimental to an individual embryo, it is beneficial to the whole population by ensuring that only normally developed embryos survive. We note that the two models proposed in this review are by no means comprehensive but serving as a framework for future modifications. Models of the developmental roles of p53. A, A “constitutive” model: p53 and its functionally redundant players, presumably p63 and p73, are constitutively regulating the developmentally essential genes. The loss of p53 is partially compensated for by these redundant players. B, A “passive” model: p53 signaling is activated by stochastic dys-regulation of developmentally essential genes. In the basal condition, p53 is inactive but can be activated in response to developmental stresses. Therefore, p53 signaling plays a “passive” role in development. The stochastic nature of developmental stresses results in the low penetrance of developmental defects in p53 null mice. ES cells, as an excellent model for early development, have provided many novel insights into the developmental roles of p53. However, ES cells only represent a snapshot of development. p53 regulates very different sets of genes in different cell types . Caution needs to be taken when extrapolating the results in ES cells into other developmental stages. The epigenetic landscapes in different cell types will shape the p53 signaling. For example, the p53-Wnt axis is tightly associated with ES cells but not in MEF and neural progenitor cells. In addition, how the p53-miR axis connects to the developmental program is largely unknown. More studies are needed to put the piece of p53 in development into the big puzzle of the tumor suppressive function of p53 in order to more effectively design therapeutic, preventive and diagnostic strategies to combat cancer. As the approaches of systems biology and genomics become increasingly available, they will provide more insights into the developmental roles of p53 and the relationship between development and cancer. We apologize to our colleagues whose work cannot be referenced in this review because of the page limit. We thank Mangmang Li, Nan Roche, and the reviewers for critically reading the manuscript. We also thank the NIH Fellows Editorial Board for their review of the manuscript. JH’s laboratory was funded by the intramural fund, 1ZIABC011158. MHS, YH, and JH wrote the review. All authors read and approved the final manuscript.